The mere fact that your medical service vending business is a relatively new opportunity does not guarantee success, however, coupled with the fact that it has a boundless market, high demand, nation wide advertising and a proven track record, this very well may be the most exciting thing that has every happened to you financially. Americans spend over 12 Billion Dollars per year on over the counter medicine, that's $34 Million per day. That�s over 40% of what the entire vending industry produces. With the growing awareness of liability and expence employers have, you can see why this service is in such high demand. You can fill a machine for $30.00. Pills come in compact envelopes and take up very little space. An order could probably fit in you glove box. Possibly one of greatest values of the Remedy Center is how often you will need to service it. With a capacity of over 200 packets, you�ll be going to your machine much less frequently than with any other merchandiser. Your time is important, that�s why vending is so attractive to you. 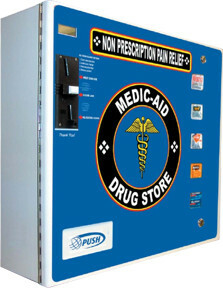 Average cost for the product will range between 15 to 25 cents with the best sellers (pain relievers) being the cheapest. With an average resale of $1.00, your markup can be 500%. How many businesses do you know that offer this? In addition, the market is "Wide Open". As mentioned earlier, with a ground floor opportunity, you have the advantage of locations not being saturated with this machine, so RESERVE YOUR LOCATIONS TODAY.